I’m not a fan of pre-made desserts but there is something about Place-and-Bake cookies that overrides my high homemade standards. If I remember correctly, place-and-bake cookies came in log form. It was up to the consumer to slice the desired thickness of each cookie. I loved that aspect of slice-and-bake cookies. Instead of candy, I’d ask for these cookies in log form. I would surreptitiously slice and eat thin slivers of raw cookie dough. Despite these cookies being plain sugar cookies, they tasted better because they were dyed with bright holiday colors. It’s the same taste logic behind funfetti. Other than sprinkles, is there a difference between vanilla and funfetti? No. But sprinkles make things taste more vanilla-y. Sure it’s a placebo effect and I play right into food company’s hands, buying seasonal products. I guess I’m easy prey. I like bright and shiny things. 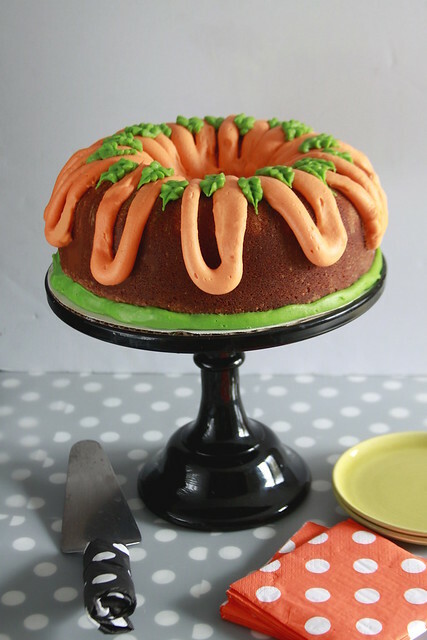 Though I love decorative bundt pans, a simple design will work better for this cake. The batter itself is lusciously thick and moistened by full-fat sour cream and of course butter. 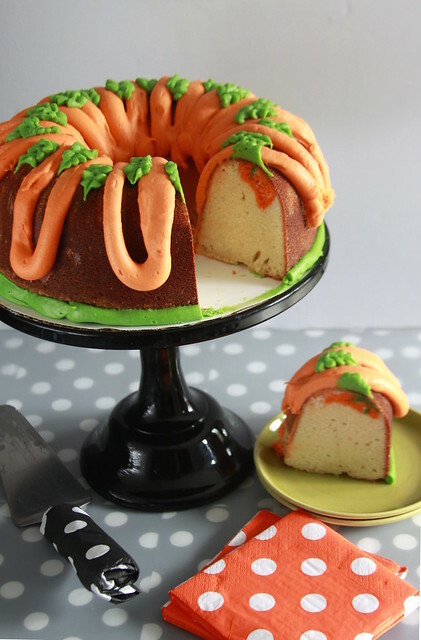 The Halloween Cookie Bundt Cake is simple to assemble. Spread a bit of batter in the bottom of the ring, place cookies, pour batter, bake, and frost. I’ve learned from my mistakes. I need to bake these sugar cookies before baking them in the bundt pan. Baking the cookie beforehand ensures that they’ll keep their shape and you’ll see clear definitive cookie pictures. I guess this means I’ll have to have a “rematch” post with a second version. 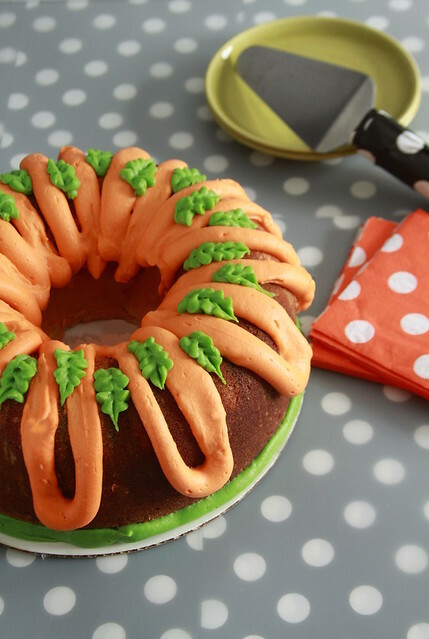 Topped with orange and green frosting gives this Halloween Cookie Bundt Cake a pumpkin look. 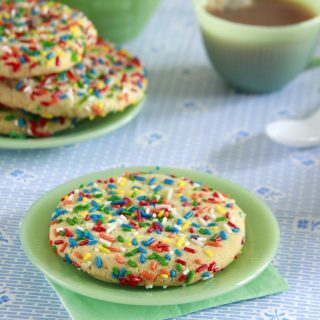 Using evaporated milk in the frosting rounds out that sugar cookie taste. 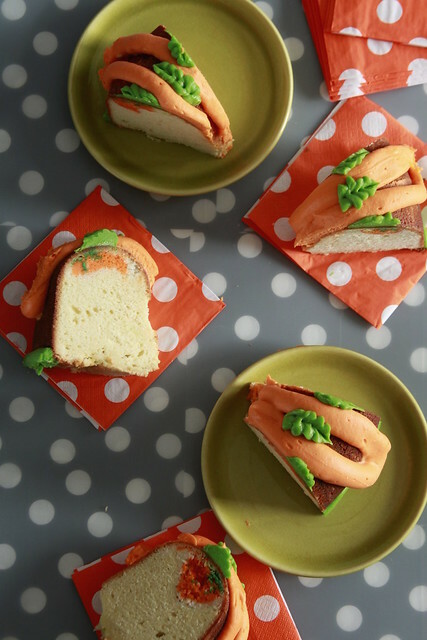 So finish out this candy filled holiday with this Franken-treat—half cookie and half bundt cake! 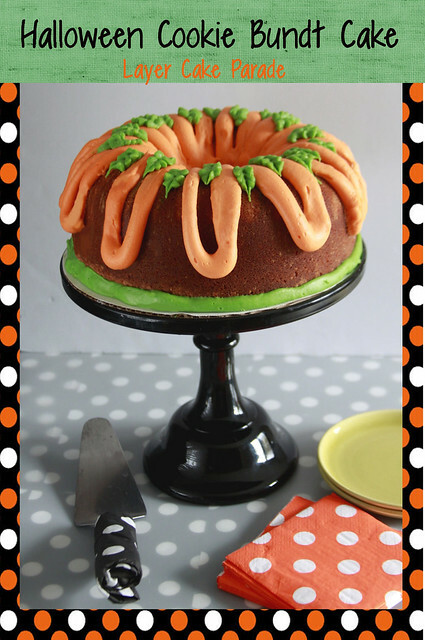 Preheat oven to 350 degrees F. Spray a bundt pan with baking spray, set aside. Sift the flour, baking powder, and salt, set aside. Cream the butter and sugar in a stand mixer fitted with a paddle attachment on medium speed scraping the sides and bottom of the bowl as needed, about 4 to 5 minutes. Beat in the baking emulsion. Add the eggs, on at a time, beating well after each addition. Scrape the bowl as needed. With the mixer on low, add the dry ingredients in 3 additions and the sour cream in two additions, beginning and ending with the dry ingredients, beating until just incorporated. Give the batter a few stirs by hand to ensure everything is mixed. 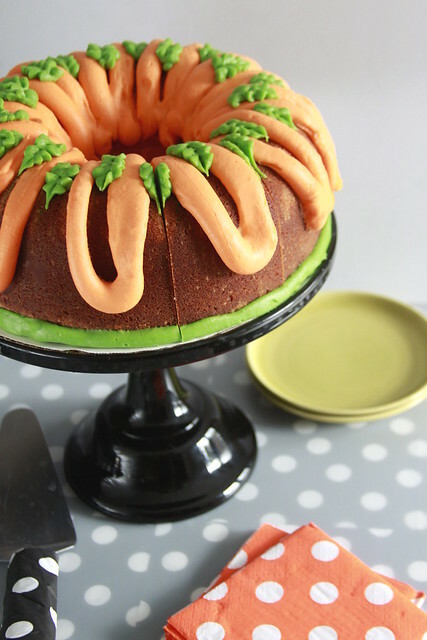 Pour a 1-inch thick layer onto the bottom of the bundt pan. Stick the cookies into the batter, as close as possible to the next cookies. Pour the remaining batter in, spreading gently. 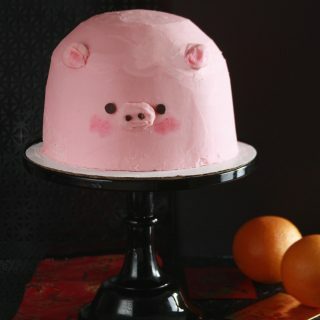 Bake for 70 to 90 minutes. 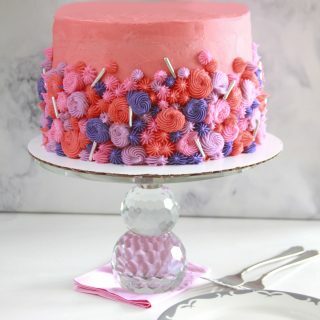 A toothpick (a long one to get to the center) inserted should come out with a few moist (not wet) crumbs. Cool in the pan for 10 to 20 minutes before invert it onto a wire rack to cool completely. In the bowl of a stand mixer fitted with a paddle attachment, beat the butter and cream cheese on a medium speed until lump free, about 2 minutes. Scrape the sides and bottom of the bowl down and beat on medium-high for 1 minute. With the mixer's speed on low, gradually add the powdered sugar and evaporated milk. Scrape the sides and bottom of the bowl as necessary. Raise the speed to medium and beat for a final 30 seconds. 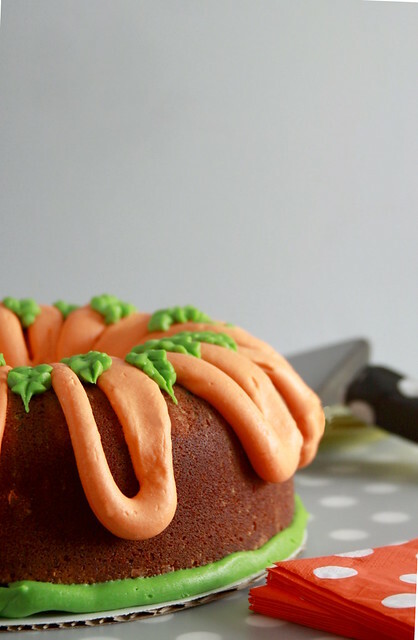 Use a round tip to pipe the orange frosting. 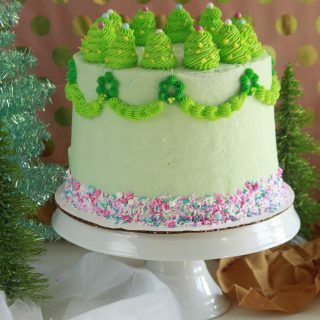 Use a leaf tip to pipe the green frosting.